The Kyoto Prize at Oxford is part of The Kyoto Prize, an international award to honour those who have contributed significantly to the scientific, cultural, and spiritual betterment of humankind. The awards are held annually in November, in Kyoto, Japan. The Laureates travel to Oxford in the following May, where the Blavatnik School of Government at the University of Oxford hosts them, presenting a series of events and lectures. Extending the graphic style used for The Kyoto Prize internationally, I designed and styled a series of promotional materials for The Kyoto Prize at Oxford. As well as posters and flyers, I created event invitations, promotional banners, backdrops for the events themselves, and the events programme. 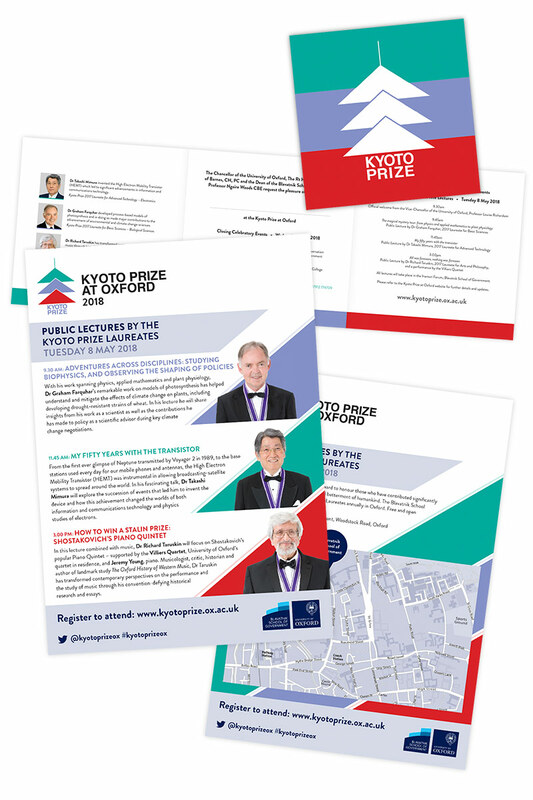 A consistent, clean, dynamic and meaningfully colourful design was applied across this wide range of materials, giving The Kyoto Prize at Oxford its own identity as an important and highly-regarded event.